The story of one woman’s incredible 2,903 mile drive across America in her 1904 Oldsmobile, is told in Joy Across America, a new book launched at Race Retro at Stoneleigh Park on 21-23 February 2014. Joy Rainey is no stranger to motorsport, having competed in karting and hillclimbing. From those first steps into motorsport, Joy then developed a love of endurance events, including the London/Sydney Marathon and crossing South America in a Jeep on the Carrera Sud-Americana. However the trans-America trip in her Oldsmobile would be her biggest challenge to date. The 1904 Curved Dash Oldsmobile dates from near the dawn of motoring and features tiller steering, two gears and a top speed of around 28 mph. The car enjoyed a detailed rebuild by Joy’s partner Trevor and the couple planned to undertake the challenge in 2009, however Trevor sadly passed away and it looked like the trip would never happen. 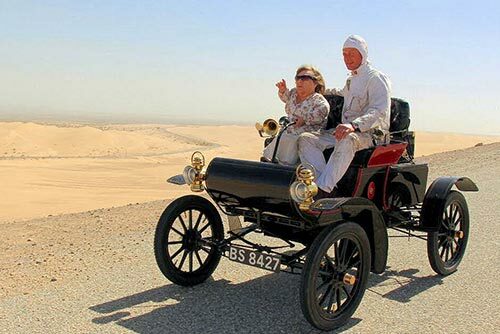 Joy decided to tackle the epic drive in Trevor’s honour and in April 2013 she arrived in America, taking on everything from smooth highways to dirt tracks and off-road sections There were plenty of problems along the way but 31 days later Joy arrived in Florida, achieving something no woman had previously accomplished in a single cylinder car. With a foreword by motor racing legend Sir Stirling Moss, the story is told over almost 200 pages along with Joy’s own photos from the journey. Priced at £18.95, the book will be available from Joy’s website as well as at Race Retro between the 21st and 23rd of February, where Joy will appear alongside the Oldsmobile. Joy will also be interviewed on the live stage along with Sir Stirling Moss (Saturday only) as well as a fantastic line up of motor racing legends who will be signing autographs and memorabilia.